The Co-curricular committee of the school provides an effective platform for students to pursue different hobbies and give boost to their creative talents. Various functions and events are organised to celebrate important days and festivals and ensures maximum participation of students and teachers in these events. Exhibitions and programmes are also arranged to display their creativity. Educational Trips are organized on regular basis to give students exposure in different fields like leadership, team building, life skills etc. It is mandatory for the students to choose one hobby of their choice from the various activities like Karate/Judo, Vocal and Instrumental Music, Aerobics, Dance(Classical/Modern), Painting, Yoga, Dramatics/ Theatre, etc. which have been introduced by the school for the benefit of the students. The school management has created a comprehensive programme for conducting games and sports activities in order to provide an opportunity to the students for nurturing their physical, social and personal development and to ensure development of various skills and competencies for playing different games & sports. Facilities for Basket Ball, Volley Ball, Badminton, Cricket and various athletic events like shotput, discuss throw etc. are available in the school. Specialised coaches are employed to guide and train budding players and students are being encouraged to take active part in various events at state and national level. Sports & Cultural Wing is responsible for conducting various activities throughout the year. The House wise competitions like Hindi and English Poetry recitations, Music, Calligraphy, Creative writing, Quiz, Storytelling, debates etc. are organized on regular basis. The aim of Scouts and Guide unit of the school is to encourage the physical, intellectual, social, emotional and spiritual development of the students so that they play a constructive role in the society as responsible citizens. The unit organizes various camps and activities for the students on regular basis. More than a 100 students have enrolled them selves in the scouts and guides programme of the school. Students have won the Rashtrapati and the Rajya Puraskars on numerous occasions. The NCC Naval Unit of the school aims to develop qualities of Character, Leadership, Comradeship, Courage, and Discipline amongst the young cadets enrolled in the programme. 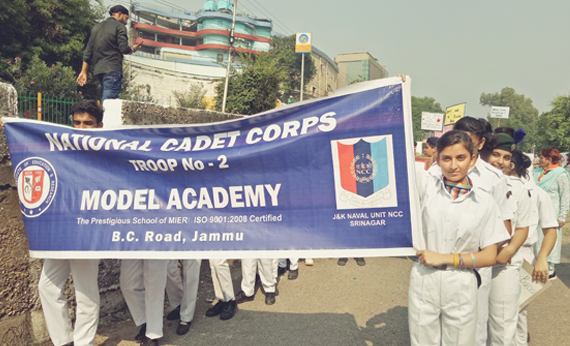 The students develop a Spirit of Adventure, Secular Outlook and the ideals of Selfless Service by participating in a number of activities organised through NCC camps at various locations throughout the year. The cadets learn boating, swimming, rigging, firing, ship modelling and about various means of communication at the camp. Our NCC cadets have won various awards including the &apos; Best Cadet Award &apos; numerous times.